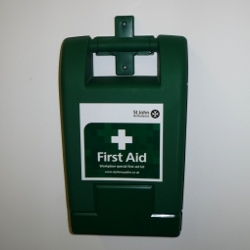 28 June to 2 July 2010 is First Aid Awareness Week. The campaign is being run by Dorling Kindersley (publisher of the First Aid Manual) along with the UK's leading First Aid providers - St John Ambulance, St Andrew's First Aid and the British Red Cross. It's a great opportunity to think about what first aid knowledge and equipment you have in your home or workplace and whether you are prepared should the need arise. New to first aid (or more than 3 years since a course)? Sign-up for first aid training. Learning first aid could help save a life! Don't leave it until it's too late! What are you doing for First Aid Awareness Week? Let everyone know if you are doing anything for First Aid Awareness Week by leaving a comment below. It could be as simple as buying new plasters for your first aid kit, or you could be involved in a national publicity scheme - I'd be interested in finding out more.